March | 2015 | Why Is The Internet Broken? Have you been feeling like you’ve heard this cloud marketing pitch before? Does it feel “buzzy”? Deja-vu? There’s a reason for that – you have. Read about it all here! 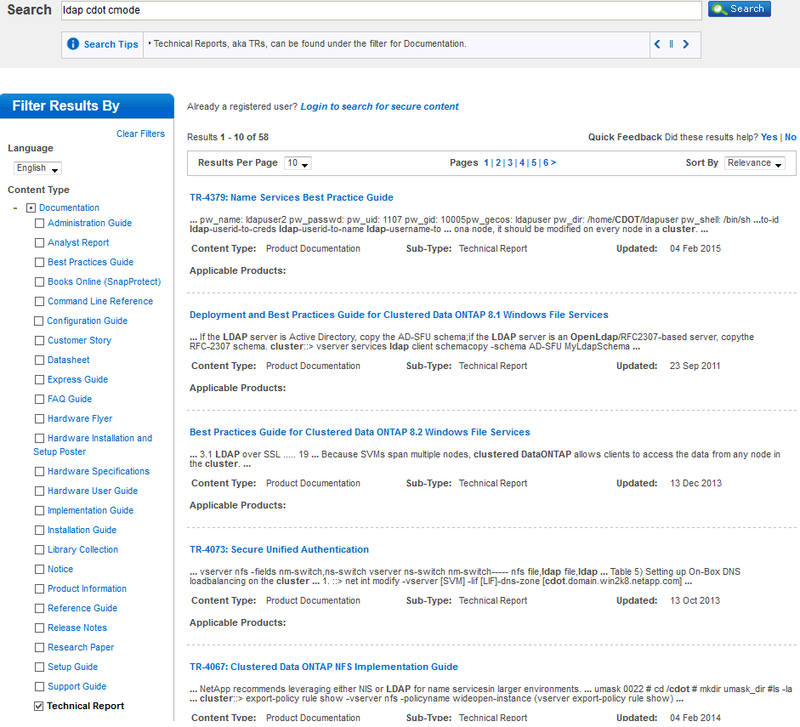 TECH::What’s the latest ONTAP 8.3 release? For cDOT 8.3.1 news, check out my other blog post. The following covers the latest 8.3 patch release for the 8.3 flat version. I highly recommend going to the latest patch release of 8.3.1 instead. UPDATE: 8.3P2 is now available! Data ONTAP 8.3 was the first clustered Data ONTAP-only release delivered by NetApp – cloud-ready, with the closest feature parity ever in clustered Data ONTAP (cDOT) and richer feature sets than previous versions of cDOT. For more information on 8.3, check out the Top 5 Enhancements in Data ONTAP 8.3 and What’s New for NAS is Data ONTP 8.3. Prior to GA, 8.3 had two release candidate (RC) versions. RC versions have completed a rigorous set of internal NetApp tests and are are deemed ready for public consumption. Each release candidate would provide bug fixes that eventually lead up to the GA edition. Keep in mind that all release candidates are fully supported by NetApp, even if there is a GA version available. However, while RC is perfectly fine to run in production environments, GA is the recommended version of any ONTAP software release. Awesome! Where can I get it? vSphere 6.0 is GA today, so re-blogging this with some added information! I’m a tad late to the party here, as there have already been numerous blogs about what’s new in vSphere 6.0, etc. I haven’t seen anything regarding what was missing from a NFS perspective, however. So I’m going to attempt to fill that gap. What new NFS features were added? I get asked a lot of questions. I get them via email, phone calls, walkups, Twitter, and communities. 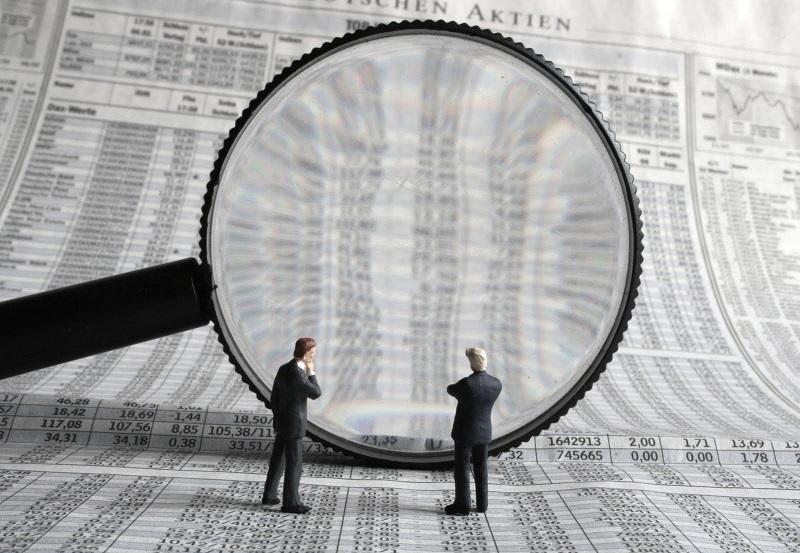 There is always a common theme with many of the questions – where do I find information? Search has come a long way over the last decade or so. Search engines are caching our history (like it or not) and helping direct us to where we look most. They are being crawled and indexed constantly. Invalid or inappropriate results get moved to the bottom of the lists, while the most useful ones are moved to the top. However, even with all the search improvements out there, it’s still hard to find stuff. We don’t know what we’re looking for. We don’t ask the right questions. Technology changes faster than we can learn it. Documentation is long and boring. All of the above are valid excuses why we can’t find information. 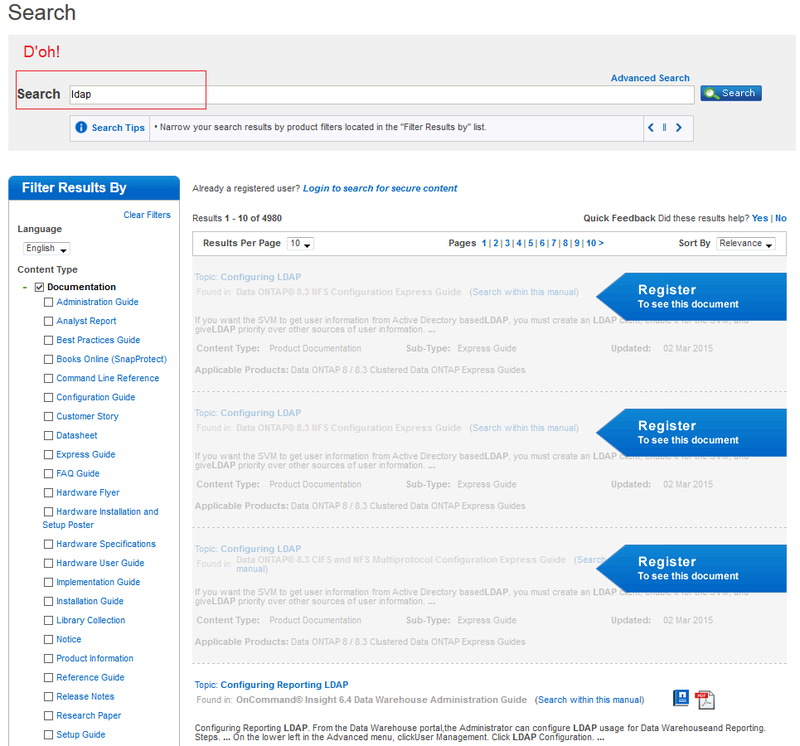 At NetApp, we have three main places for customers to search for information about ONTAP and associated products: kb.netapp.com, mysupport.netapp.com and the NetApp communities. This site has two gateways. One is for general public consumption and does not need a login. The other is for people who sign up for a support login account. The general public one gives less access than the one you sign in for. 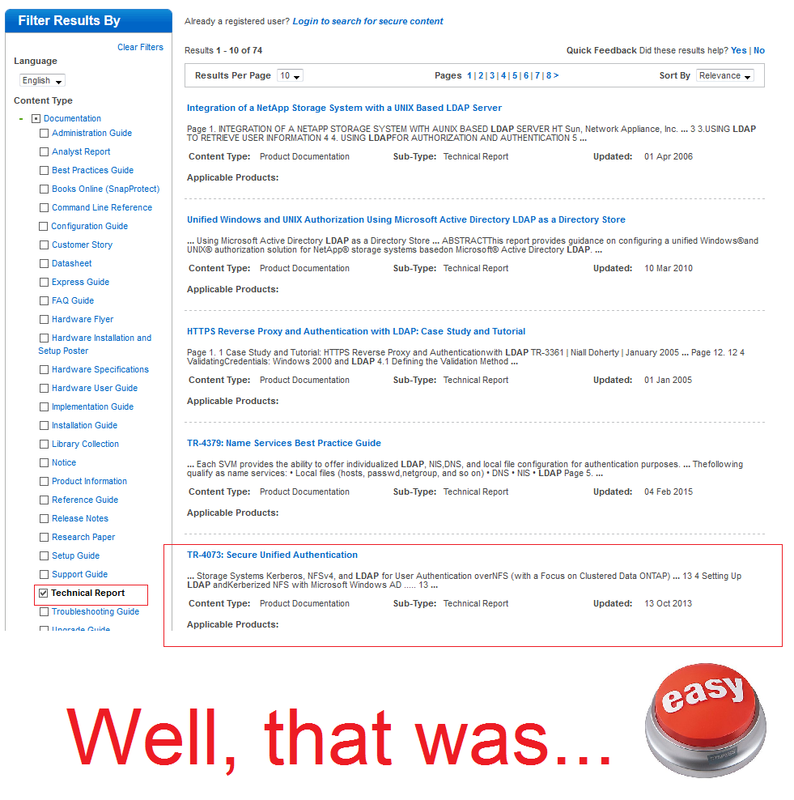 For instance, only registered users get access to download NetApp software and tools. I’ll keep this post limited to the general one that everyone sees. 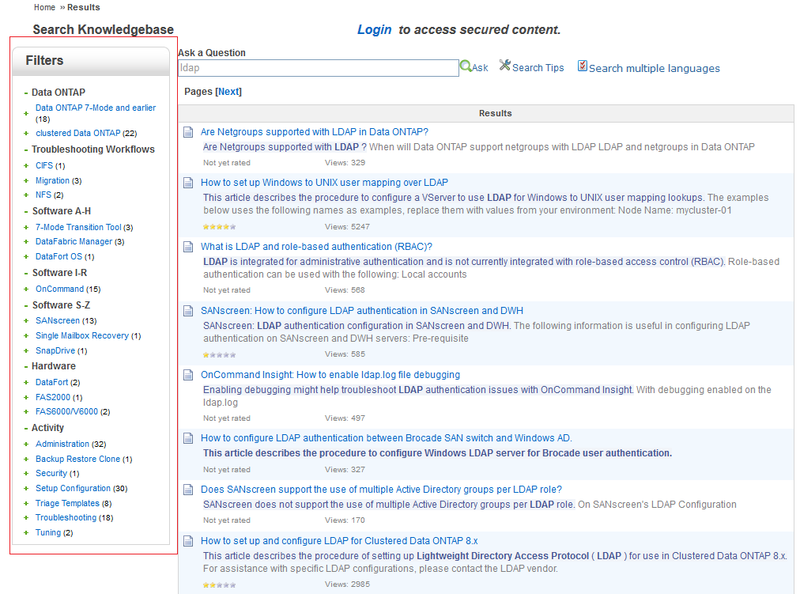 With this one, you get access to documentation and the knowledge base in your search results. When doing the keyword search, there are a few tricks to keep in mind. Sometimes misspelled words can work, but the results may vary greatly. For example, the results for “ldap” vs “ladp” can vary quite a bit. Notice in the above results, we get things we don’t really need/want? But even then, maybe I need more detail, such as what TR-4073 provides. With the default settings I have above, I am getting EVERYTHING with the word LDAP in it. KB articles, product documentation, TRs… by the time I find TR-4073, I am on page… ah, who am I kidding. I gave up by page 16. However, most of that stuff, I know I don’t need. For instance, I can leave out “express guide” because I’m not registered. And do I really need anything related to “hardware” here? If I know all I need are TRs and Product Docs, I should just check those. In my case, I know I want a Technical Report (because TRs are awesome! ), so I just check that one and… voila! In addition to filtering, keywords should also be used with multiple entries. Doing this helps the search figure out what you are really trying to ask it. Notice in the results how all the keywords added to the search are in bold type. In the images above, you might notice that there is a “Search Tips” box under the search field. 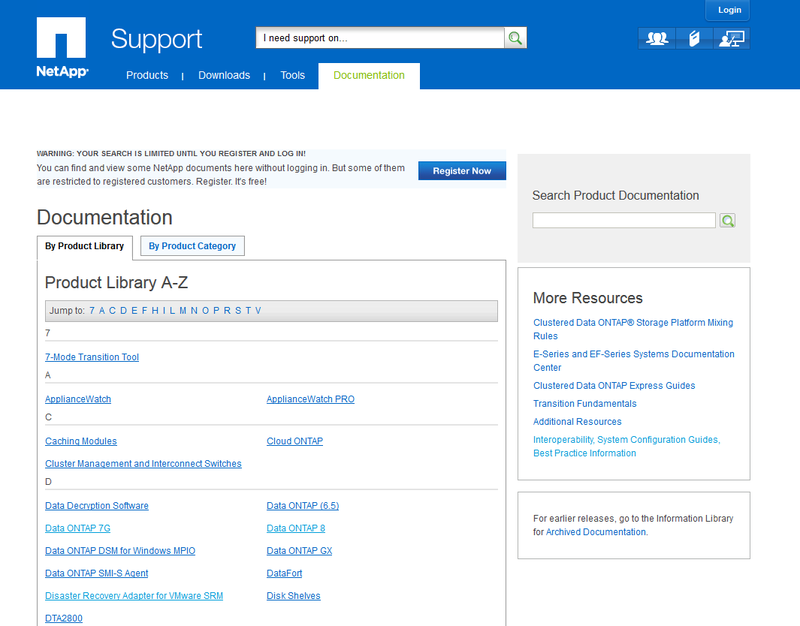 These rotate as you are on a page and give information on how to better navigate the support site search. There is also a hard landing page. Bookmark it! For instance, did you know you could use Boolean logic in searches? 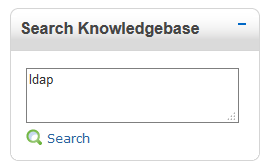 Another place to find information is via the NetApp Knowledge Base. This site covers mainly the KB article side of the house, so if you know you are looking for KBs, use this site. 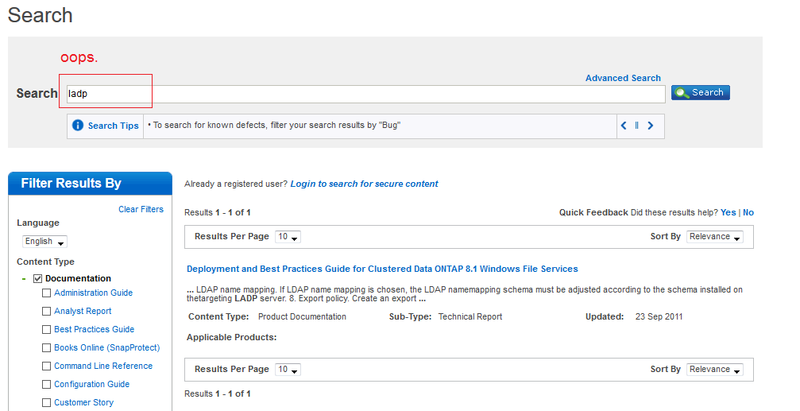 However, you can also find KB articles via the support.netapp.com site (with appropriate filters). 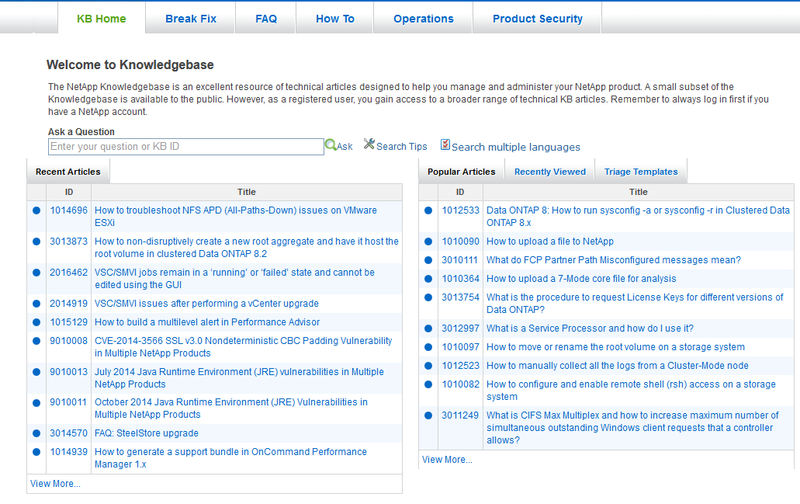 A KB is an article written by NetApp employees to cover specific issues seen in the field. These can be break/fix, how to, FAQs, or troubleshooting guidelines. They aren’t going to be as in-depth as TRs and will usually cover specific scenarios, but you can still find some useful information. When you arrive at the landing page, there is a handy-dandy list of recent and popular articles. 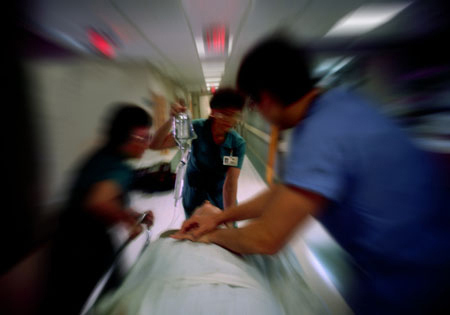 A triage template is a list of questions that are asked to cover most generic issues and potentially solve a problem before it comes to the point of a support case – similar to a triage room at a hospital. There is also a main landing page that can be found here. On that page, you can even filter by ONTAP mode. And as you drill down, you can filter by other categories, like performance. Yeah, but what about search? Oh, right. You want to *find* stuff. This also does a keyword search, similar to the support site, but only searches for KBs. And in case you want to be meta, a KB that talks about how to search KBs. Even has a video! 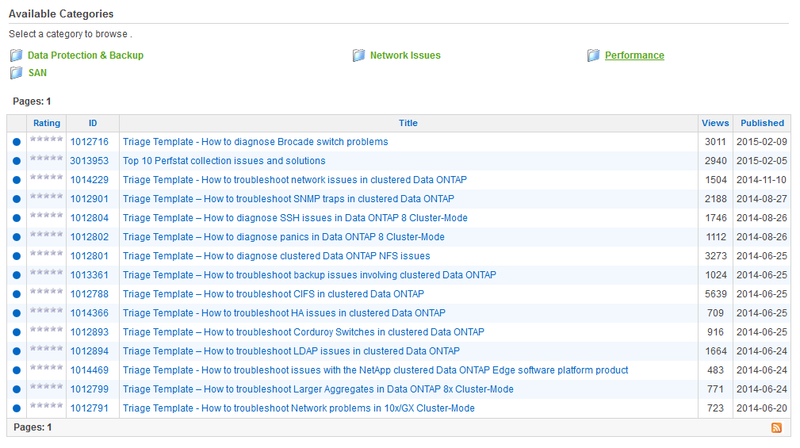 Another useful resource to find information is the NetApp Communities. 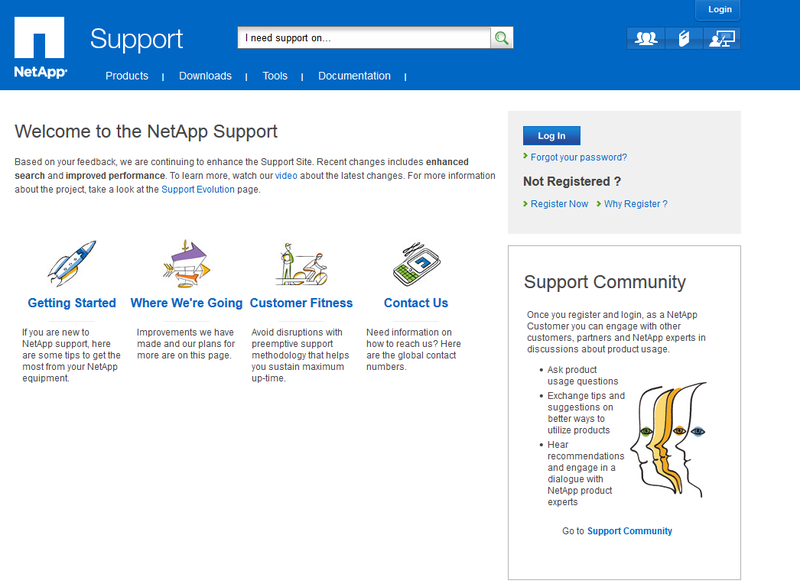 These operate like any other support community – you can search for keywords, read posts and find information from other users outside of NetApp for a more balanced view. Like any community, they are what you put into it. Feel free to ask questions, but also answer questions. If you don’t get a response, then you may have to go other routes, but you can at least put out feelers. But, chances are, you aren’t the first person to run into the issue you are seeing. In addition to forums, the communities also include blog posts from NetApp technology leaders as well as the TechONTAP Newsletter! TECH::NFSDudeAbides and DataCenterDude team up! If you’ve ever been to datacenterdude.com, run by the @datacenterdude himself (Nick Howell), then you’ll know it’s chock full of tech goodness for virt and storage nerds. I recently had the opportunity to volunteer my services to his efforts and now am officially a part of the datacenterdude.com team! My first contribution was about snapshots and backups called Snapshots & Polaroids: Neither Lasts Forever. Check it out! I’ll still be manning this blog as well. I’ll just be pulling double duty! It’s not just me, though. There are a number of other rock solid tech experts. 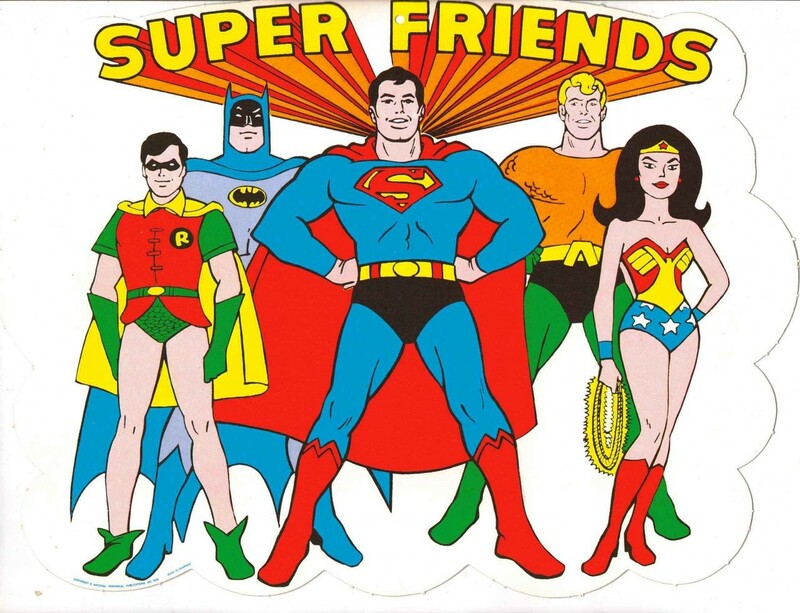 Meet the tech super-friends at http://datacenterdude.com/about/!